You know, there’s something thrilling about seeing another author succeed, especially when you know how hard they’ve worked to achieve their goals. I was so delighted when Jenn J McLeod announced that she’d been contracted by Simon and Schuster Australia, and even more excited to discover her debut novel, House For All Seasons, is the Dymocks Pick of the Month in the March issue of the Australian Women’s Weekly. Now how’s that for praise! The truth will bind them forever. Bequeathed a century-old house, four estranged friends return to their New South Wales hometown, Calingarry Crossing, where each must stay a season at the Dandelion House to fulfil the wishes of their benefactor, Gypsy. But coming home to the country stirs shameful memories of the past, including the tragic end-of-school muck up day accident twenty years earlier. At the Dandelion House, the women will discover something about themselves and a secret that ties all four to each other and to the house – forever. Oooh, intriguing! Nothing like a juicy secret to keep you turning those pages and you can own your own copy right now by clickety-clicking on over to Booktopia (a bookseller I am feeling the luuuuurve for after their sponsorship of ARRC2013). Or try Dymocks or QBD The Bookshop. If ebooks are your thing, then try the Kobo store (which I also luuuurve thanks to Kobo’s ARRC 2013 cocktail party and multiple ereader giveaways), Amazon Kindle or Apple’s iTunes store. Now that you’re all stocked up, please welcome Jenn! Cathryn, your publishing journey inspired me to keep trying. I remember the day you announced online your two-book deal with Penguin. Having submitted a novel myself I was certain I’d be taking this journey with you. But my big announcement would be another twelve months away – also a two-book deal – with the amazing Simon & Schuster. So now I’m here, right where I want to be, with my debut novel on the shelves and joining you on a Friday Feast. Life’s good. But life’s even better with good food, so let’s talk about that. Being part of your Friday Feast I can’t help but smile as it combines my two greatest passions—writing and food; I’ve been lucky enough to make a business out of them both. My tree-change was like coming home. Coming home to the country is also the theme of my Australian small town stories and House For All Seasons is the first of two set in the fictional town of Calingarry Crossing. House For All Seasons is a story about small-town life, family relationships and country roots that run deep. And yes there’s a cafe in it, even though I have since sold my cafe to focus on my new career as published author *big grin*. I instead spend my days writing contemporary women’s fiction and running Wagtail Cottage— a dog-friendly B&B we purpose-built for people who travel with their pets. Food for me these days is healthy, fresh and homemade. This recipe is so simple you’ll never buy highly sugared/salted, packet muesli again. 500 gram pkt of rolled oats, coconut (long thread is best), sunflower seeds, sesame seeds, canola/vege oil, honey, hot water. After cooking add sultanas and toasted almond flakes (optional). Spread the 500 gram pkt of rolled oats over the two sprayed pans. Place the roasting pans in the oven and SET THE TIMER for 10 mins. Check/stir mixture every ten minutes until the entire contents is a golden colour and dry. Depending on your oven it could take about an hour. Set a timer for each ten minutes rather than rely on your memory. Oh yum! That sounds delicious, Jenn. Actually your Wagtail Cottage sounds gorgeous and one of these days I plan to visit it in person. So, my lovely Feasters, what’s your favourite breakfast? 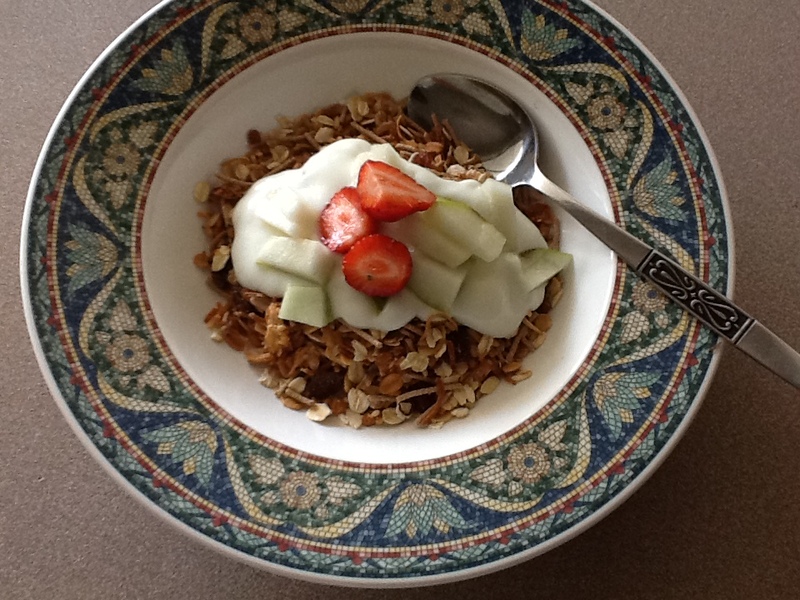 Are you a healthy muesli sort or completely naughty and skip it all together? I’m a Vita Brits girl, except on weekends before golf, then it’s a big cooked brekky courtesy of the man of the house. He does a fiiine job too. 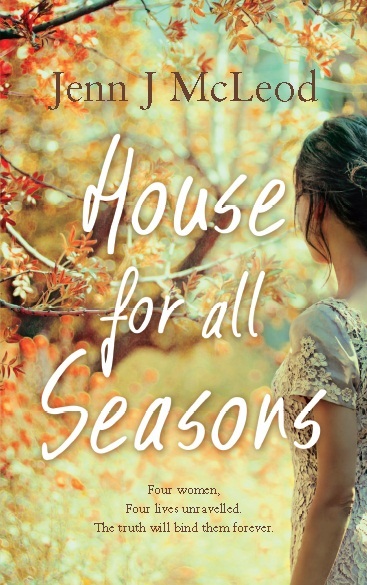 If you’d like to learn more about Jenn and House For All Seasons, please visit her website. You can also connect via Facebook and Twitter. This entry was posted in Friday Feast and tagged Australian romance authors, Australian Romance Readers Association, Australian Writers, Booktopia, breakfast recipes, Calingarry Crossing, Cathryn Hein, Cooking, Dymocks, ebooks, Food, Friday Feast, Home-made muesli, House For All Seasons, iTunes, Jenn J McLeod, Kindle, Kobo, promo, QBD The Bookshop, Recipes, Simon & Schuster Australia, Wagtail Cottage on March 22, 2013 by cathrynhein.